A new video game featuring Jason Bourne is being developed by High Moon Studios (formerly Sammy Studios). The Bourne Conspiracy follows their first game, Darkwatch, since the studio was renamed in 2005, after which they were acquired by Vivendi Universal. 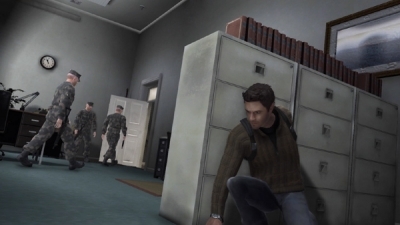 The game is said to be based on both Ludlum’s novel The Bourne Identity as well as the film adaptation starring Matt Damon, but also containing a new story that was approved by the Ludlum estate. According to the developer it will be a third-person espionage action game focusing on gunplay and close combat. It’s currently being developed for the PlayStation 3 and Xbox 360. Earlier this month the second Bourne novel written by Eric Van Lustbader was released, The Bourne Betrayal, and in August the third and supposed final film starring Matt Damon, The Bourne Ultimatum, will be released in theaters. In case you guys get bored waiting for the next James Bond video game. Treyarch is still busy with that. Probably won’t get new information on it till 2008, unfortunately, but I hope to be proved wrong. E3 is coming July 11 through the 13 followed by E For All starting October 18. If we hear anything this year it’d probably be then, but I’m rather doubtful. The game Treyarch is working on is said to be an adaptation of Bond 22, though I’ve always suspected that because of the long period of time between when Activision first acquired the rights to the release of Bond 22 that there may be a second game already in the works. But that’s just speculation.